This is a Banksy and yet not. The original image of two policemen kissing has been transferred to canvas and is now in storage. And that, as the Guardian reported last week, is up for sale. “We got it taken off a couple of years ago. What started to happen was people started to vandalise it, a lot of homophobes,” explains Carl Turton, barman in the pub on the other side of this wall. “It’s still Banksy today as it’s still there. It’s still Banksy artwork. Someone just spray painted over the top of it,” he adds. So one piece of semi-anonymous street art has become two. Such work is impossible to authenticate and impossible to look after. As the owners of The Prince Albert pub in Brighton have discovered, a frame serves little purpose on an exterior wall. One of these two works will be vandalised regardless and one will enter a collection. Strange to think that folk with £1m budgets still have plenty of time for Banksy’s confrontational statements. 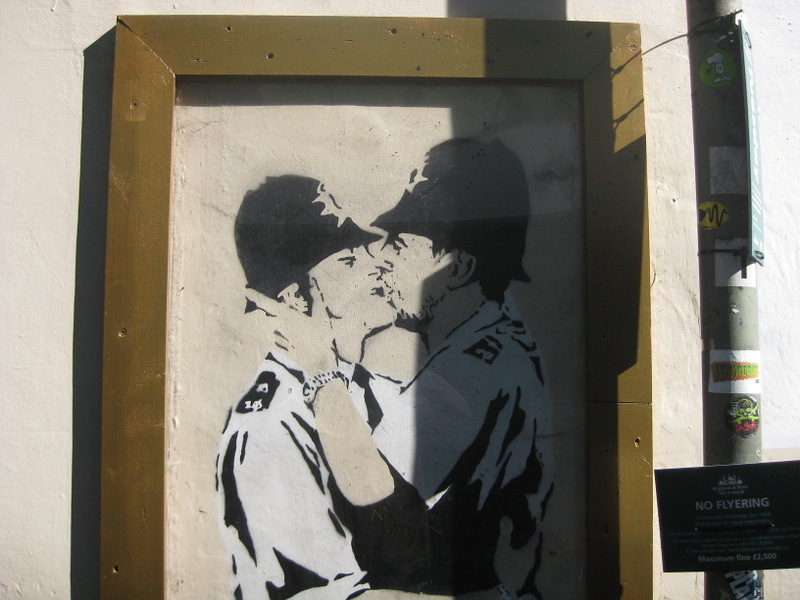 But if you take away the sense of confrontation and remove kissing policemen, etc, from the street, you take away the ostensible point of making a work like this in the first place, surely. Pub owner Chris Steward has said the work on the wall is 80% Banksy. What he might well have added is that the work for sale, the original, now represents just 20%. The scramble to buy and sell street art seems in keeping with its prankster ethos. But it is beginning to look if the real target of this political graffiti is the art world, rather than the authorities. The untitled Banksy in question can be seen in varying states of disrepair on the wall of The Prince Albert, Trafalgar Street, Brighton.